This might mean that I won’t be able to go back to Iran for a long time, since Iran doesn't recognize Israel, has no diplomatic relations with it, and apparently considers traveling there illegal. Too bad, but I don't care. Fortunately, I'm a citizen of Canada and I have the right to visit any country I want. I'm going to Israel as a citizen journalist and a peace activist. So far, the arrest of Hoder has not been confirmed by other news sources. What prompted him to return to Iran? Hope he is released soon! Pingback: Weblogsky » Blog Archive » Hossein Derakshan arrested? you guys know so little about this guy! !He’s a well-known Iranian intelligence lackey and has you all miffed! He is a staunch supporter of Khomeini and Ahmadinejad who has blown the whistle on a number of Iranian human rights and civil activists resulting in their arrest and imprisonment. The news of his arrest is very suspect, don’t you think? Re Arash Sahami’s comment, I’d like to ask that he provide some evidence for these dangerous accusations. Hossein is a “well known intelligence lackey”? According to whom, Mr. Sahami? Do you have your own intelligence sources for any of these claims? One may not like his politics or tactics, but if hossein has been arrested, there is cause for worry, and all those who pretend to be human rights activists, and those who claim to work for justice, should be alarmed at this arrest and speak out against it. Derkhshan is the most pro-mullah regime blogger out there…this news can not be real. It’s probably publicity stunt. Derkhshan is not to be trusted and I won’t be surprised to find out that he is part of this set up. He needed a publicity really bad and his dad arranged it for him. I hope Americans’ will not fall for it. THIS GUY IS NO SPY FOR ISAREL–AU CONTRAIRE, HE PROBABLY SPIED ON THE ISRAELIS FOR THE MULLAHS. 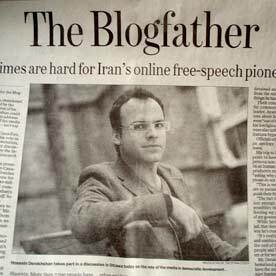 HIS BLOG IMPRESSED ME AS WRITTEN BY A MODERATE INTELLECT WHO IS EASIY INFLUENCED BY ANYTHING HE READS–FOR A WHILE HE WAS REGURGITATING FOUCAULT –AND OPENLY ESPOUSING ANTI-SEMITIC IDEAS ON HIS SITE–YOU NOW, THE JEWISH CONSPIRACY (AKA NEO-CONS)–DEFENDING AHMADI NEJAD’S USE OF THE PROTOCOLS OF THE ELDERS OF ZION IN HIS UN SPEECH–IN SHORT, THIS HODER CHARACTER IS A REAL LOSER –BUT HE IS NO SPY, AT LEAST NOT FOR ISRAEL. What a Shame for Iran. He is one of the best intelligence of his country. I’ll try to do wathever i can to help him, from France… he was here in Paris few months ago, a crazy thing that something like this happens to someone like him.